This is the flat Version of my Sims VCA. The original Elektor Formant VCA used two 3080 in series. In most cases only one is used and the second one only adds to noise and distortion. This VCA is AC coupled only. The THD in the Elektor Formant VCA is about 1% and the noise to voltage ratio is not that good either. Time to look for a replacement. 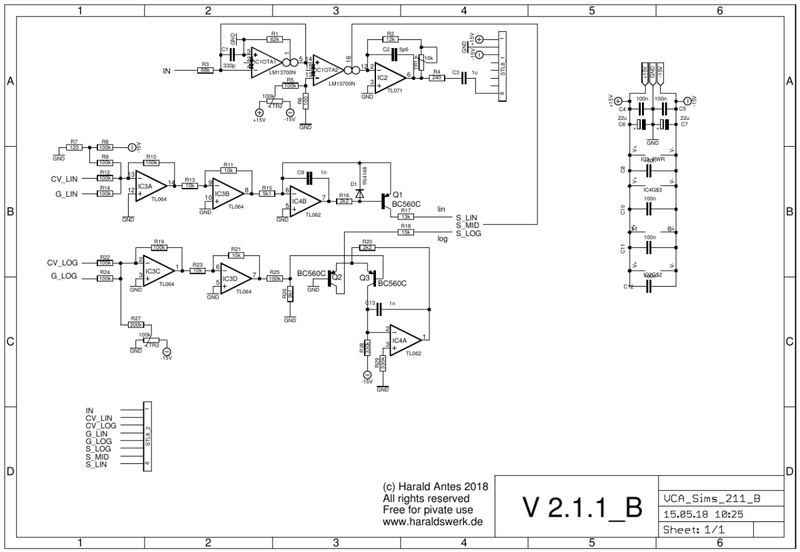 I wanted a decent DC coupled audio VCA to process audio as well as control voltages. And easy available parts (2014/08). I tried different architectures and then decided to separate audio and DC VCA. With specialized VCA it is easier to reach both goals. I made my own implementation of the Sims-VCA introduced by Mike Sims in the EDN Magazine January 1995. With this architecture it is possible to achieve THD of 0,02%. Unfortunately i can not confirm the statement from Mike Sims that trimming the circuit for minimum THD achieves minimum control voltage feedthrough. Trimming for minimum THD causes an constant DC bias at the output. I have had to add a output capacitor to avoid the bias at the output. And you need test equipment to measure the THD for correct trimming. If you can not measure THD better build my DC-VCA . You can achieve 0,2 % THD here. Still good. 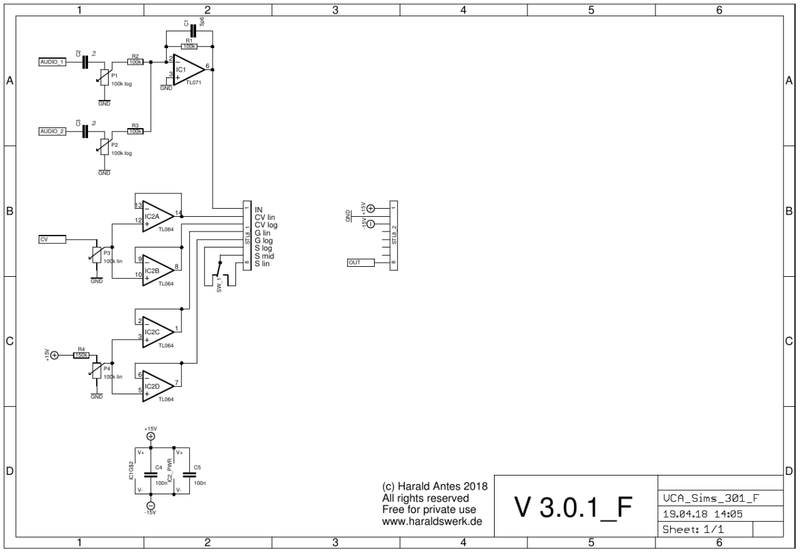 Insert 5Vpp sinus signal to one off the inputs. Set pot to max. Choose linear response. Set Gain to max. Adjust TR1 for the output to match the input signal.